Submitted by witness on Thursday, April 10, 2008. LOCATION DETAILS: it was about 2 miles up river on the greenbelt not too far after you go under the railroad track off of 380. OBSERVED: I live in Frisco Texas, and me a friend go kayaking at the greenbelt quite often, Denton county, it connects lakes Lewisville and lake Rayroberts together, We started kayking and probably went about 2 miles when we came upon a log jam we could not get around. So we had to get off the water and go around it on the shore. When we were about to put our boats back in the water my friend yells for me to look at something and we came upon a series of unusual footsteps that looked non human but bigger then any other animal that is in this area. 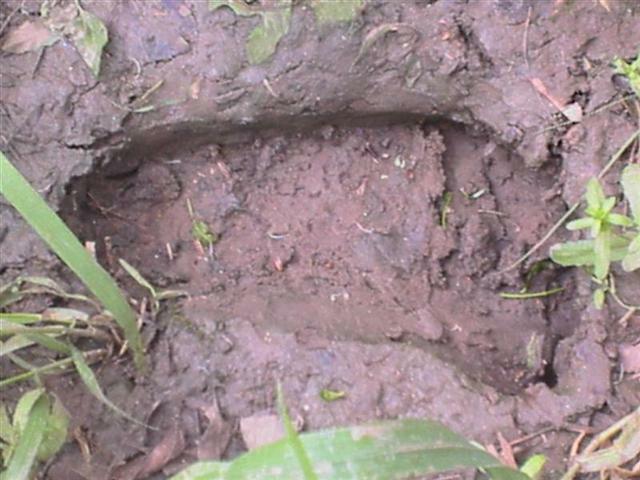 I did some research and noticed that there hasnt been any sightings in this area but these are very unusual human like animal tracks. I do have pictures. ALSO NOTICED: It could be just a coincendence, but after we left the area we kept going up river but when we turned around and came back by the spot you heard a wild pig squeeling in the around the same spot. OTHER WITNESSES: Yes my friend he was walking with his kayak in front of me. I was following. OTHER STORIES: No i did reasearch and could not find any other sightings in this area. ENVIRONMENT: Swamp, Forest, near railroad. I made contact with the witness by email and he forwarded me two pictures of the prints they found. Estimated length of the tracks was 12 inches. This area is called the Greenbelt Corridor. It is a state park that connects Lake Ray Roberts and Lake Lewisville where they are both connected by the Elm Fork of the Trinity River. There are two trails running parallel along the river. One is equestrian and the other is for bikes. Both trails accommodate hikers. The corridor is 10 miles long and is anywhere from 100 yards to one mile wide depending where you are at on the trail. In researching past reports, there was a class A sighting 9 years ago not 5 miles away. A two-man investigation of the area resulted in some possible vocalizations and some additional smaller prints that were interesting but nothing in size comparison with the picture. Another investigator and myself ended up going to a location where we heard possible tree knocks. We stayed put at this location until dark. While we were waiting, some things, possibly rocks, were thrown at us from across the river. One hit the bank right by us and the second in the water behind us. We walked back to the trail and proceeded north. We went 3/4 of a mile north up the trail. We made a few different calls. We received a response in three different areas in a triangular pattern with us in the center. We continue to check this area out but have had nothing further to add to this report.